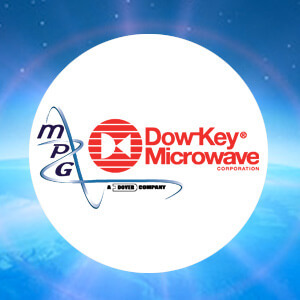 Dow-Key Microwave's vision is to build trust with our partners to ensure their long-term success and to be the leading global provider of the best RF Switch solutions through our product offerings, customer service, and continuous process improvements. Dow-Key Microwave is committed to serving your quality and compliance requirements. 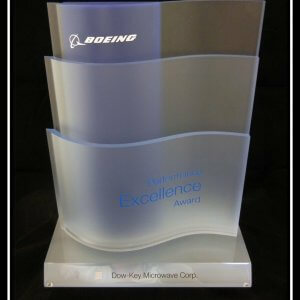 Our quality management system is AS9100 and ISO-9001 certified, and we have a long record of supplier excellence awards from many of the leading aerospace OEMs. We also offer a wide range of RoHS compliant products. Dow-Key Microwave has long served the leading aerospace OEMs and Tier 1 avionics integrators with RF/microwave switches and switch system. We design and build our commercial products with a keen appreciation that our components often serve mission-critical applications such as air traffic control and navigation. Dow-Key Microwave designs and manufactures switch matrices for communications and automated test applications by integrating electromechanical, fiber optic and solid state elements. We optimize our electromechanical switches to meet the most demanding signal conditioning specifications including Low PIM and low insertion loss. Because our matrix platforms are modular, you can install a system that can grow with your application. Dow-Key Microwave is leadings supplier of space-qualified coaxial and waveguide switches and switch block assemblies. We have flown on over 200 missions ranging from communications and navigations satellites to the Space Shuttle without a single reported failure. With two clean rooms and a full environmental testing capability including mulipaction, passive inter-modulation, vibration, thermal shock, and thermal vacuum, Dow-Key is ready to meet your high-reliability specifications. Dow-Key Microwave specializes in custom switch matrix designs to fit your specifications. Whether you require switch components to integrate your own switch matrix or need a turnkey, fully integrated rack system, Dow-key has the solution. We offer a wide range of solutions: coaxial switches from DC to 40 GHz, waveguide switches up to 70 GHz, switches with Low PIM level, low insertion loss and high repeatability. We are the premier supplier and manufacturer of space qualified switches with an in-flight failure free record in over 100 different programs. We offer a wide portfolio of software controlled RF Switching Systems supporting ATE, AVIONICS, SATCOM, SPACE and CUSTOM applications including Low PIM, Low Insertion Loss Repeatability solutions. For faster delivery, we carry our most popular switches in stock and have programs in place for standard parts which are offered at a lower price and with a shorter lead time.